We’re happy to introduce a new Site Audit update: it now supports integration with Trello — one of the most convenient collaboration tools. 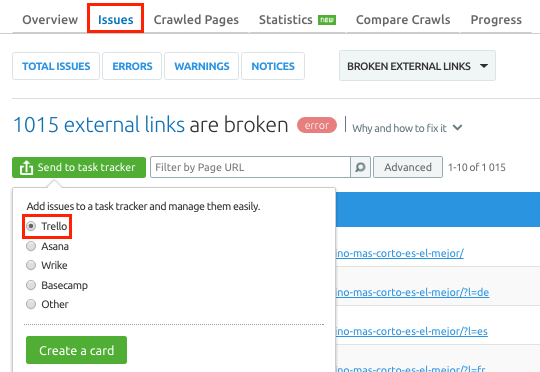 Now you can easily add issues found on your site to Trello boards and manage them. All you need to do is go to your Site Audit campaign and click on the ‘Issues’ tab. You’ll then see ‘Trello’ at the top of the dropdown menu. And there's more good news! The same integration option is now available for the SEO Ideas tool. Go to your SEO Ideas campaign and select any of your 'Ideas’ blocks in the ‘Overview’ or the ‘Optimization Ideas’ tab. After clicking on one of them you’ll be taken to the SEO Ideas list: the ‘Send to Trello’ button will be right at the top. Meet the New Organic Traffic Insights!